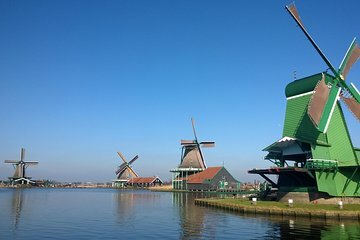 Scopri le tradizionali delizie olandesi di Zaanse Schans in una gita di un piccolo gruppo al pittoresco villaggio sul fiume di Amsterdam. Visita una fabbrica di zoccoli e un caseificio per vedere come questi prodotti classici sono ancora fatti a mano, e scrutare sulla campagna dal balcone di un mulino a vento funzionante. Excellent tour guide and very interesting. Only downside is "lunch provided" is a coupon for pancakes at sub-par Amsterdam cafe. This trip was great!. My friend and I got to be driven out to the old windmills. Our group leader was very knowledgeable about the history of the windmills. We got a trip back and then vouchers for a pancake lunch. Yum! Really good tour , a lot of information provided by out tour guide.There were many people that choose to take the train and travel independently but I will definitely recommend having a guide.